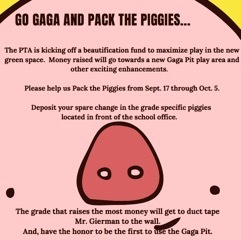 AMES FAMILIES – PLEASE HELP US GO GAGA FOR PACK THE PIGGIES! Help us Pack the Piggies September 17 through October 5. The Ames PTA has created a beautification fund to maximize pay in the new green space next door. Money raised will go towards a new Gaga Pit play area and other exciting enhancements. Kids can deposit spare change in the grade specific piggies located in front of the school office. The grade that raises the most money will get to duct tape Mr. Gierman to the wall and have the honor of being the first group to use the Gaga Pit!